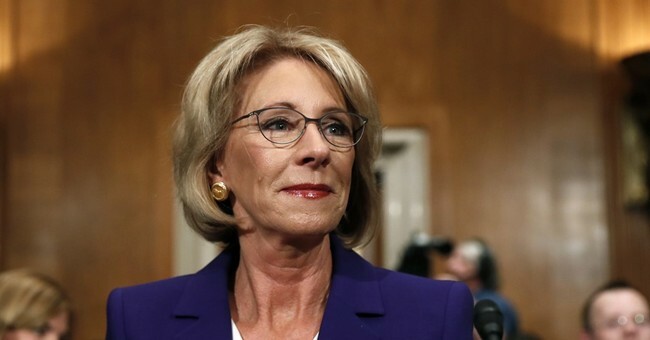 DeVos' ultimate ideological crime is her consistent commitment to siding with students over powerful teachers' unions -- whose leaders have occasionally let slip where their priorities lie. A critique of unions, by the way, is not tantamount to a criticism of teachers. As a product of excellent public schools, I am forever grateful to the dedicated and talented professionals who provided me with a strong education. But what DeVos recognizes is that millions of students are denied the opportunity to attend great, or even competent, public schools. This is deeply unfair, and forcing low-income students to remain locked in chronically failing schools, due only to their zip codes, is immoral. As such, DeVos has been a leading advocate for school choice, which empowers parents and students to break the cycle of underperformance. This compassionate and genuinely progressive idea enjoys bipartisan support, even if that reality was not reflected in today's vote. If you're concerned about the control a bureaucrat has over a child, maybe we should reduce the control bureaucrats have over all children.